It's been five years since Alfonso Cuarón wowed with the release of Gravity and as has become trademark Cuarón, his new movie, on the surface at least, looks nothing like his previous projects. 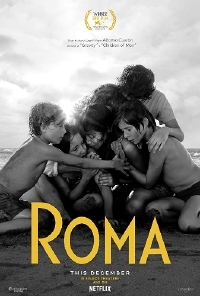 Written and directed by Cuarón, Roma is a semi-autobiographical drama following the ups and downs of a middle-class family living in Mexico City in the early 70s. The movie, which caused a ruckus when it was pulled from the Cannes line-up earlier this year, has gone on to wow at every festival it has played at, is beautifully captured in black and white and the trailer, though it doesn't give much in the way of story, is captivating; the haunting Pink Floyd accompaniment certainly helps. This really feels like a labour of love for Cuarón who has his fingers all over this production. In addition to writing and directing, he's also credited as cinematographer and co-editor with Adam Gough. Roma isn't Netflix's first big production but it's certainly one of the buzziest and the first to have real awards contention which explains why the streaming service is giving the movie a limited theatrical engagement on November 24 prior to release on the service on December 14.